Hello! So good to see each of you. Have I ever told you how very special each one of you are to me? Probably not, so let me say it here & now. YOU are special to me. You are the Creator of Destiny, the Intuitive Genius & the Follower of Dreams. Thank you for sharing your time with me. As you know by reading my previous entries, I’ve hit a bump in life. I’ve come to understand that these bumps are our opportunity to learn & grow. I’ve also come to learn to be grateful for these opportunities. These are the times when the Teacher arrives. Most of us have heard the saying, “When the Student is Ready, the Teacher will arrive”. My experiences have been such that the arrival of the Teacher is during a speed bump time. These are the perfect times to build the muscle memory of the Teacher’s lessons. The lessons this time seem to be centered around the understanding that I have no control. I have no control over the conditions that arise. I also have had no control over my own reactions nor emotions to these conditions. I was driving myself crazy. 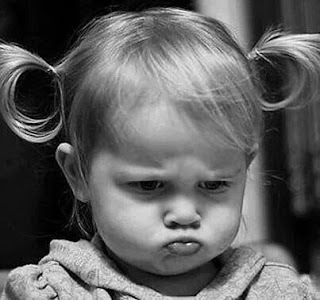 I was unhappy, sullen & depressed. 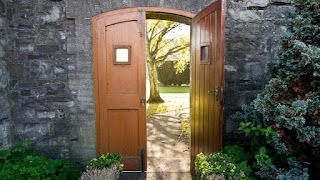 In the past year or so doors have been opening to me. I have been learning why I live in a negative state. I have been learning there are tools to change it around. I started picking up these tools. Now I have the tools, had a chance to role play them & the speed bump comes up. I’m learning Essential Oil blending recipes that are aiding me in relaxing, calming, focusing. Meditating so my brain can learn to function in the positive. Listening to my body, moving, stretching, strengthening, nourishing, opening up the flow of energy. Another door that has opened & provided tools & teachers has been our Peer Support program. About 2 years ago my office implemented the program. I put in my memo of interest & was selected. We attended a four-day training with The International Counseling Team. We learned how to listen to people & when it was time to refer them to qualified help. Last year it was a 2-day training. Dr. Kevin Gilmartin was the presenter. He wrote the book “Emotional Survival for Law enforcement”. He is incredible! Let me give some background regarding the Peer Support program. 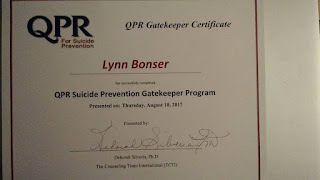 Peer Support programs started in Police Departments. Police officers have one of the highest suicide rates of all careers. Dr. Gilmartin had a background in the military, Law Enforcement & became a behavioral scientist. His passion is to open eyes to this epidemic. From his understanding of the mental outlook of his brothers in blue the idea of Peer Supporters was born. From Law Enforcement, the program has spread to other First Responders, like the Fire Departments & EMTs. Then it was realized the 911 Dispatchers also were suffering from the trauma of being First Responders. And the Peer Support program grew. Dr. Nancy Bohls-Penrod has spent her entire adult life married to a sheriff’s deputy. As she lived the life & went to school her passion has become for Public Safety servants. Her belief & foresight have taken her to The Counseling Team International. They help set up the Peer Support Programs in Public Safety. Dr. Bolhs-Penrod happens to reside in San Bernardino County. Her work & her husband’s career have opened doors for her. 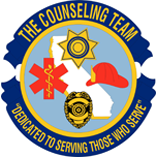 Due to her persistence, San Bernardino County District Attorney Office has started the Peer Support Program. It is open to every position & we have quite the varied crew. It’s awesome to be a part of this program. It also has become one of my tools. This year’s training was 2-days. 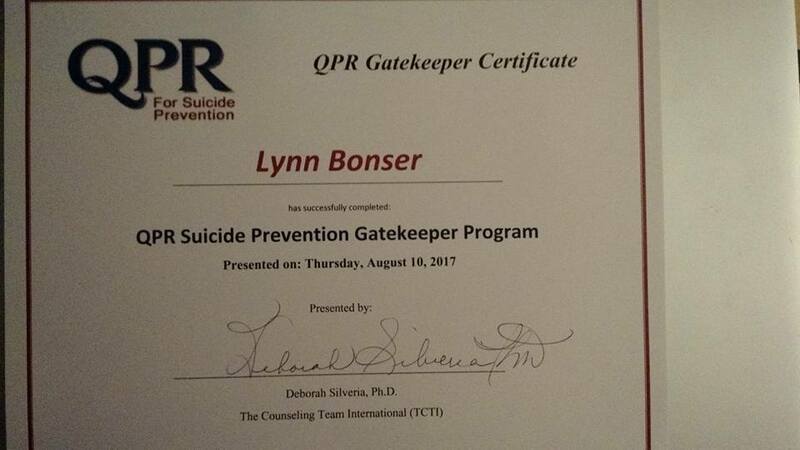 At the end of the first day I had earned a certificate of completion for QPR Suicide Prevention Gatekeeper Program. It just means I have been provided guidance in asking the Question, how to possibly Persuade them to agree to seek help & then Refer them to where they can receive help. But it was Day 2 that opened an important door for me. Oh my, I see I’ve run a bit long today. I’ll have to stop here. When I started writing this blog, I promised myself that I would keep these to between a page & a page & a half. This one, even without the pictures, is touching page three. My apologies for being overly long winded, but there is so much I want to share with you. Self awareness is a beautiful thing. It's only when we confront ourselvex that true change and growth are possible. Another lovely post. Thank-you. I agree, this journey of self-awareness is amazing!! Thank you for joining my community, Sonja!